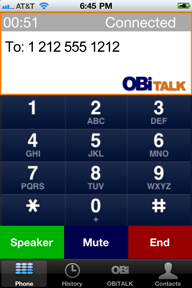 When you have access to at least one OBi device which you own or you are inside its Circle of Trust, OBiTALK enables direct dialing to regular phone numbers from the OBiON Android, iPhone, iPad and iPod touch and OBiAPP for PC soft phone endpoints. To use this feature, the soft phone user selects an OBi Voice Gateway from a selection of OBi devices that she owns or other users' OBi devices to which she belongs to their OBiTALK Circle of Trust. In essence, a person will be able to assign their soft phone (e.g. 290 123 456) a calling gateway, whereby calls can be placed to regular phone numbers from the WiFi or 3G/4G connected OBi soft phone client. The person simply dials the phone number on the soft phone's dial pad. The OBi device assigned as the voice gateway will use its configured Primary Line to make the call. Said another way, out of ALL the OBi devices that happen to be in the user's CoT to which they belong (including their own, of course), one of these OBi devices can be selected as the user's OBi Voice Gateway, e.g. the Primary Direct Dial Gateway. If a user wants to have additional direct dial gateways, via which direct calls to regular phone numbers can be placed, the user will need to prepend the number with the target gateway speed dial code number and the star, e.g. 7*12125551212. In this example, the OBi with speed dial 7 is used to make calls to the 212 area code. When calls are made using the OBiON iPhone or Android soft phone app, the smart phone's Wi-Fi or 3G/4G data plan is used, NOT the phone's voice plan/minutes.